February 25, 1994 Jersey Joe Walcott, hall of fame boxer, died. Walcott was born Arnold Raymond Cream on January 31, 1914 in Merchantville, New Jersey. 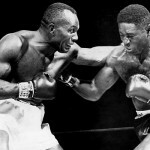 He made his professional boxing debut in 1930 and in 1951 won the heavyweight championship at the age of 37. At the time, he was the oldest man to win the heavyweight championship. Over his 23 year professional boxing career, he had a record of 51 wins, 18 losses and 2 draws. After retiring, Walcott worked as a boxing referee and in 1972 became Sheriff of Camden County. From 1975 to 1984, he served as Chairman of the New Jersey State Athletic Commission. In 1990, Walcott was inducted into the International Boxing Hall of Fame.